It’s Wednesday! 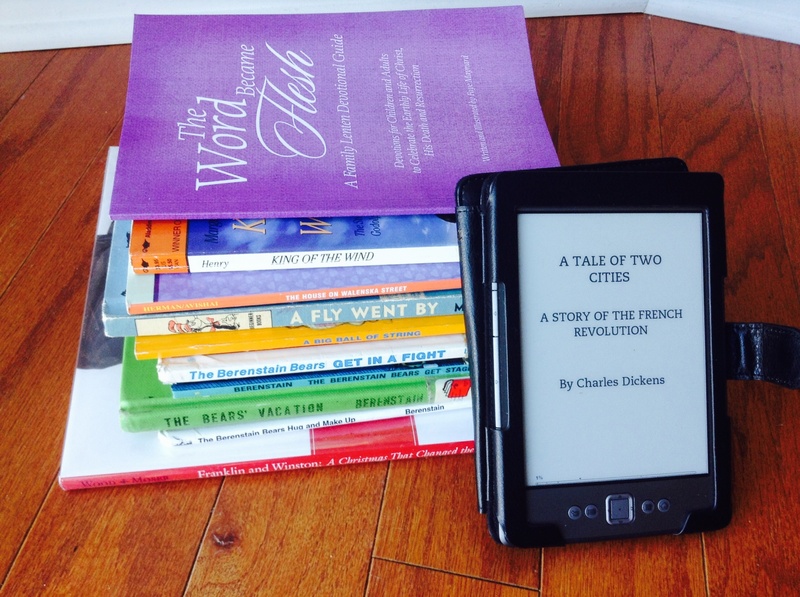 Time to take a peek at “What We’re Reading” around our Casa! I hope that you find some books to pick up for yourself, your kiddos, or your family! 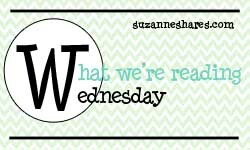 You can view past “What We’re Reading Wednesday” installments here or click on the tag cloud on the right side of the blog. The Word Became Flesh (by Faye Maynard)-Our family is continuing to journey through this devotion for Lent. This is our 4th year to use it, and we love how it puts our family in the Word, reading together about the life of Christ, culminating in the joyous celebration of Easter morning! To read more about this book and how to use it with your family, see my previous post. King of the Wind (by Marguerite Henry)-My dear friend and fellow book lover, Whitney, told me about this book. She loved horses as a girl and enjoyed this book as a child. I, not loving horses as a girl, did not read this as a child. 🙂 I found it over the weekend for $1 at a used bookstore. After Whitney’s rave review, I picked it up. After all, if it was a dud, I had only spent $1. 🙂 Once I started reading the book, though, I couldn’t put it down. The story is about Sham, a horse from Morocco and Agba, a young boy who was Sham’s caretaker. Sham and Agba have many adventures–both tragic and exhilarating–that lead them from Morocco to France and finally England. Their adventures drew me in, broke my heart and made me smile. This will be a book that I read aloud and share with my boys. I also reveled in this book because of its setting. After college, I lived in North Africa for a year and spent some time in Morocco. The accuracy of Henry’s description of the culture, language and people was spot on. The story transported me back there and made me homesick for a place I grew to deeply love. A Big Ball of String (by Marion Holland)-This was also on my middle son’s reading list and is another Dr. Seuss Beginner Book that was unfamiliar to us. It, too, was published in 1958 and appears, sadly, to be out of print. Maybe you can find a copy at your local library. The little boy in the story finds many creative uses for his big ball of string. It reminded me of how the simplest things–like a ball of yarn–are often the most entertaining for my boys. I love how such simple things breed their creativity. Franklin and Winston: A Christmas That Changed the World (by Douglas Wood)-We have been continuing in World War II readings since it was highlighted for a couple weeks in Classical Conversations. FDR and Churchill were two WWII leaders highlighted one week, so I picked this book up when I noticed it at the library. My boys eat, sleep, and breathe history, so I thought they’d enjoy learning more about these two men. This book was a fun read. Churchill ‘s fireball personality was displayed in one of the stories the book recounts from his visit to the White House the Christmas of 1941. Upon first speaking to the press after arriving in D.C., Roosevelt and Churchill sat behind a desk in a room filled to overflowing with members of the press. Roosevelt told Churchill that he wished the media could see him better. Churchill responds by climbing on his chair and standing upright in it; the media immediately embraced this memorable man. After reading the book with my boys, it became evident to me why the British unwavered in their opposition of Germany during WWII–Winston Churchill. His determined will to oppose the Axis Powers became his country’s will. I think I’m going to have to add a Winston Churchill biography to my “to read” list. Any suggestions? Loved this post! Have you read “The door in the Wall”? We loved it as a family read aloud, and it truly enriched our studies of medieval history this year. For years I’ve had the Last Lion trilogy on my shelf, meaning to read it. I’ve also heard Churchill: A Life by Martin Gilbert is good. And then of course there is also his own autobiographies. I have read (the far less impressive in length) Fourty Ways to Look at Winston Churchill by Gretchin Rubiin (of The Happiness Project fame). I just noticed too that a lot of his speeches, and even his A History of the English-Speaking Peoples is free to borrow on Kindle through Amazon.